This small eatery can get quite busy and we had to wait to get seated despite what appeared to be a lot of empty tables (it may have been because we visited on Mother’s Day and the tables may have been reserved). On this visit, we were seated at the large communal table located at the side of the restaurant. We weren’t really interested in having a huge meal here since we had just polished off a breakfast buffet at The Veranda earlier in the morning so we wound up ordering a couple of snacks as well as some interesting drinks. The Snap Pea Limeade ($5) is pretty much exactly how it sounds and you can taste the peas in this refreshing drink. Meanwhile, the Pineapple Dreamy Slushy ($4.50) was a fun drink that reminded me of a pineapple version of a creamsicle. No visit to Piggy Smalls (or The Pig and the Lady) would be complete without ordering the LFC Wings ($14). Also known as Laotian Fried Chicken Wings, these bad boys are probably as infamous as Phnom Penh chicken wings. They’re not really the same, however, as LFC Wings are meatier and have a bigger crunch to the bite. 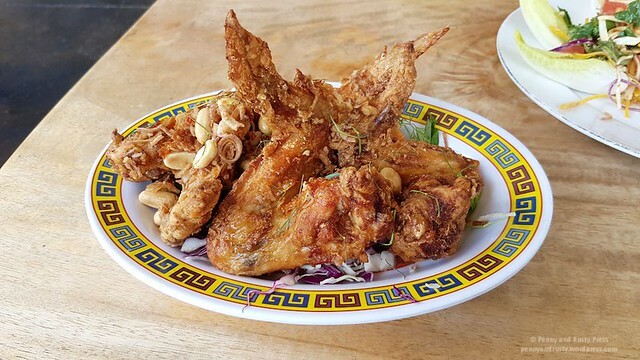 Enhanced with kaffir lime, peanuts, fried shallots, their signature “money sauce” and nestled on a crunchy slaw, these chicken wings (tips intact) will have you coming back for more. We wanted to try something different on their menu this go around and wound up ordering their slightly confusing named Not Summer Rolls ($13). Most people are probably familiar with Vietnamese spring rolls which are typically wrapped in rice paper and deep-fried while some might be familiar with Vietnamese summer rolls (or salad rolls) which are typically served wrapped in fresh rice paper (not fried). 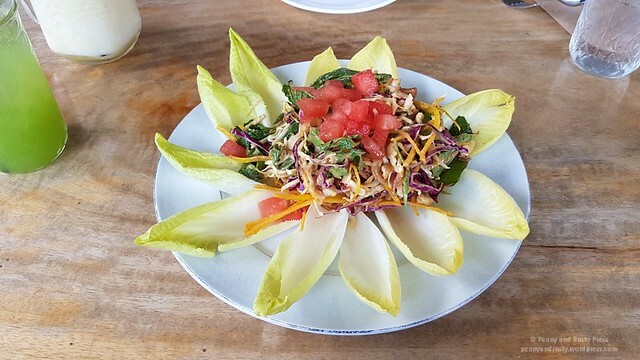 This dish is actually aptly named as it’s really not a summer roll as it uses Belgian endive cups as the carrier for the filling which is comprised of a herb salad mixed with watermelon, tofu, bean sprouts and a Vietnamese-style peanut-hoisin dressing. Call it what you will… I call it super tasty. If you find yourself hungry for some modern twists on Vietnamese fare, head over to Piggy Smalls. 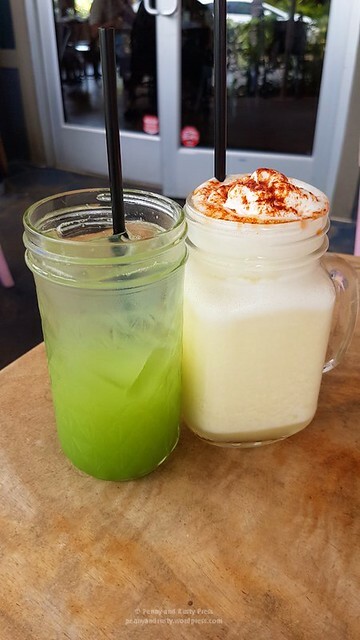 Posted on May 30, 2018, in Restaurant Review, Vietnamese and tagged Chicken Wings, Creamsicle, Food, Hawaii, Honolulu, Kaka'ako, LFC, Not Summer Rolls, Oahu, Pineapple Dreamy Slushy, restaurant review, Vietnamese, Ward Village. Bookmark the permalink. Leave a comment.